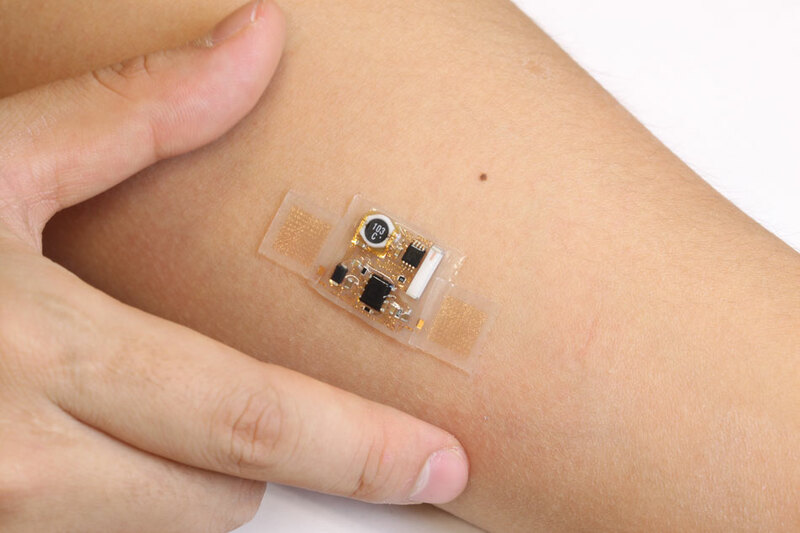 Thin, soft stick-on patches that stretch and move with the skin incorporate commercial, off-the-shelf chip-based electronics for sophisticated wireless health monitoring. The new device was developed by John A. Rogers of Illinois and Yonggang Huang of Northwestern University. CHAMPAIGN, Ill. — Wearing a fitness tracker on your wrist or clipped to your belt is so 2013. 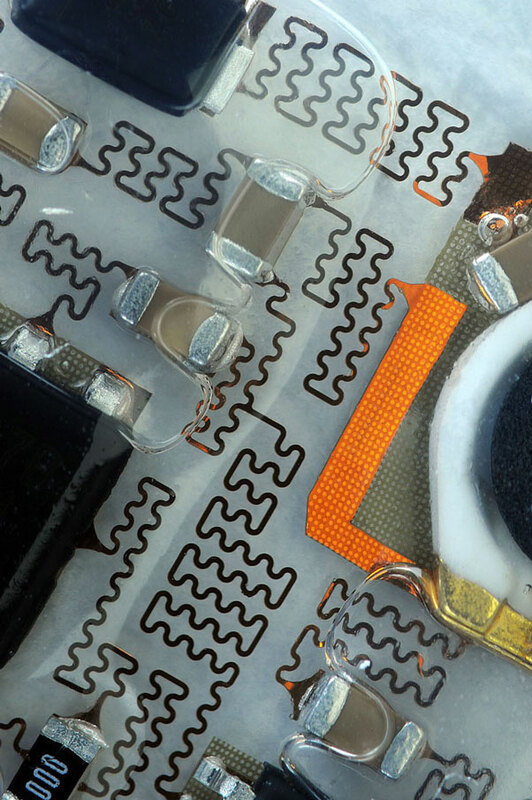 The patches incorporate a unique microfluidic construction with wires folded like origami to allow the patch to bend and flex without being constrained by the rigid electronics components. 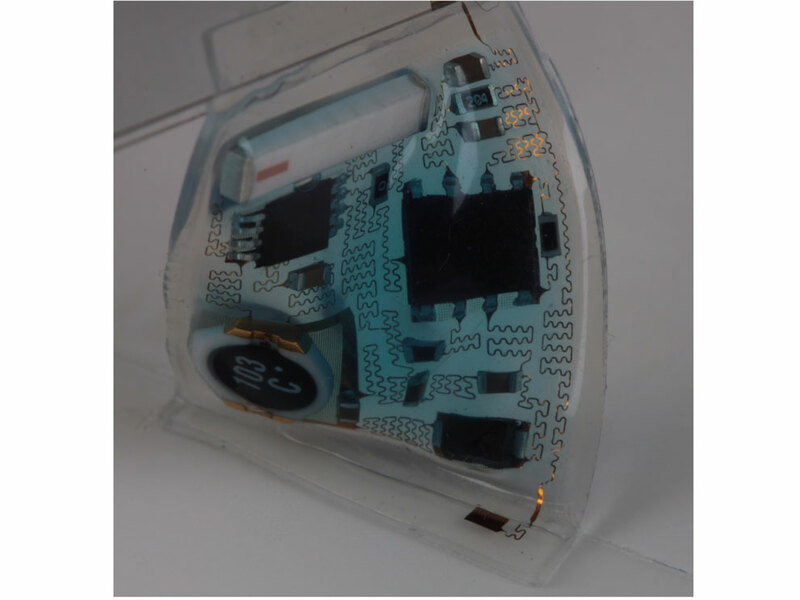 The patches stick to the skin like a temporary tattoo and incorporate a unique microfluidic construction with wires folded like origami to allow the patch to bend and flex without being constrained by the rigid electronics components. The patches could be used for everyday health tracking – wirelessly sending updates to your cellphone or computer – and could revolutionize clinical monitoring such as EKG and EEG testing – no bulky wires, pads or tape needed. The researchers did a side-by-side comparison with traditional EKG and EEG monitors and found the wireless patch performed equally to conventional sensors, while being significantly more comfortable for patients. Such a distinction is crucial for long-term monitoring, situations such as stress tests or sleep studies when the outcome depends on the patient’s ability to move and behave naturally, or for patients with fragile skin such as premature newborns. The team will publish its design in the April 4 issue of Science. See video. Rogers’ group at Illinois previously demonstrated skin electronics made of very tiny, ultrathin, specially designed and printed components. While those also offer high-performance monitoring, the ability to incorporate readily available chip-based components provides many important, complementary capabilities in engineering design, at very low cost. 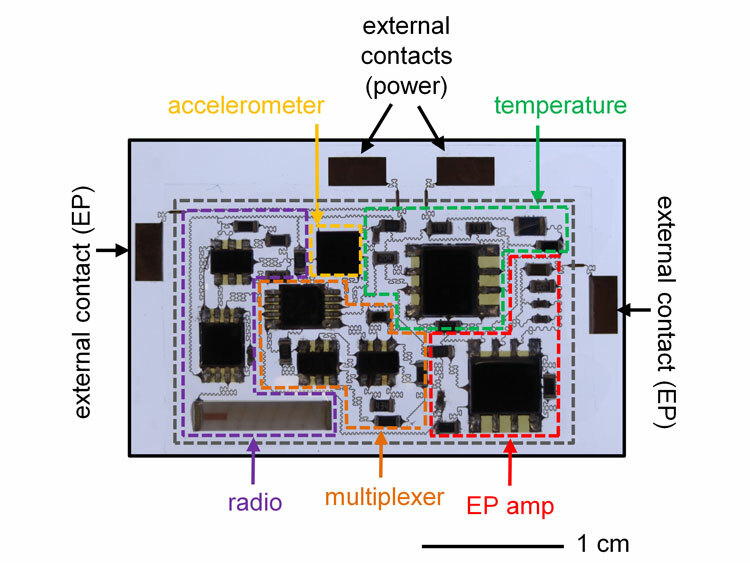 The multi-university team turned to soft microfluidic designs to address the challenge of integrating relatively big, bulky chips with the soft, elastic base of the patch. The patch is constructed of a thin elastic envelope filled with fluid. The chip components are suspended on tiny raised support points, bonding them to the underlying patch but allowing the patch to stretch and move. One of the biggest engineering feats of the patch is the design of the tiny, squiggly wires connecting the electronics components – radios, power inductors, sensors and more. The serpentine-shaped wires are folded like origami, so that no matter which way the patch bends, twists or stretches, the wires can unfold in any direction to accommodate the motion. Since the wires stretch, the chips don’t have to. A downloadable image and video gallery is available. Skin-mounted devices could give those interested in fitness tracking a more complete and accurate picture of their activity level. The researchers hope that their sophisticated, integrated sensing systems could not only monitor health but also could help identify problems before the patient may be aware. For example, according to Rogers, data analysis could detect motions associated with Parkinson’s disease at its onset. The National Security Science and Engineering Faculty Fellowship of Energy, the Korean Foundation for International Cooperation of Science and Technology, and the Department of Energy supported this work. Rogers directs the Frederick Seitz Materials Research Laboratory at Illinois and also is affiliated with the Beckman Institute for Advanced Science and Technology and the departments of chemistry, of mechanical science and engineering, of bioengineering and of electrical and computer engineering. Huang is the Joseph Cummings Professor of Civil and Environmental Engineering and Mechanical Engineering at Northwestern’s McCormick School of Engineering and Applied Science. Editor's note: To contact John Rogers, call 217-244-4979; email jrogers@illinois.edu. To reach Yonggang Huang, call 847-467-3165; email y-huang@northwestern.edu. The paper, “Soft microfluidic assemblies of sensors, circuits and radios for the skin,” is available from the News Bureau.